Buy 24 or more for $6.64 each. 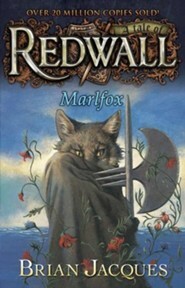 A villainous new presence is aprowl in Mossflower Woods-the Marlfoxes. Stealthy and mysterious, they are out to plunder and destroy everything in their path. 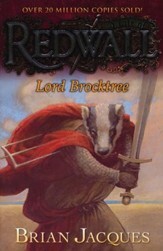 And when they reach Redwall Abbey, they ruthlessly steal the most precious treasure of all-the tapestry of Martin the Warrior. It takes Dann Reguba and Song Swifteye, children of warrior squirrels, to follow in their fathers' heroic footsteps. 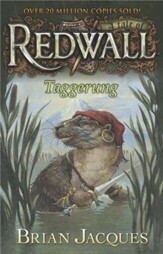 Together with the young shrew Dippler, and Burble the brave watervole, they embark upon the seemingly impossible quest. . . .
"I sometimes think it ironic for an ex-seaman, longshoreman, truck driver, policeman, bus driver, etc., to find success writing children's novels," says Brian Jacques (pronounced "Jakes"). Yet it is all too true. 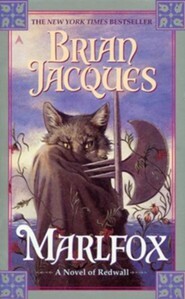 With the publication of his first children's book in 1987, the award-winning Redwall, Jacques' fresh talent has received exceptional praise from reviewers in the United States and England. 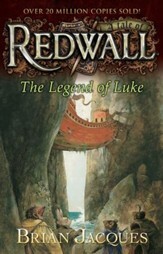 Newbery Award winner Lloyd Alexander called it "a fine work, literate, witty, filled with the excitement of genuine storytelling. Young people will surely be captivated. I hope they give their elders a chance to share the delights." A well-known radio personality in his native Liverpool--as well as an actor, stand-up comic, and playwright--Brian Jacques is the host of "Jakestown" on BBC Radio Merseyside. Ever the performer, Jacques is well-known for applying his acting and entertainment background to his lively presentations to legions of young fans at schools across the United States and England. This interest in poetry extended to Wordsworth, Tennyson, and Goldsmith.It was also at St. John's that Brian met a teacher, Alan Durband (who also taught two Beatles, Paul McCartney and George Harrison), who, more than thirty years later would bring about a major change in his life. 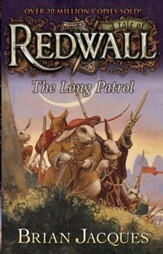 I'm the author/artist and I want to review #11: Marlfox: A Tale of Redwall.